The Coordination Committee of the Tribal Organisations of Assam (CCTOA) on Wednesday staged a sit-in demonstration at Jantar Mantar in New Delhi in protest against the Centre’s move to provide Scheduled Tribe (ST) status for six communities of Assam. The CCTOA leaders submitted a memorandum to Prime Minister Narendra Modi and Union Home Minister Rajnath Singh registering their protest against the move of the Central government. “The decision of granting of ST status to advanced and populous communities will eliminate political rights of the genuine tribals of Assam,” said Aditya Khakhlari, secretary general of CCTOA in a memorandum submitted to PM Modi and Home Minister Singh. The memorandum, submitted to the Prime Minister and Union Home Minister, was signed by all the committee leaders representing various organisations. The committee demanded that a tripartite talk be held among the Union Home Minister, chief minister of Assam and the CCTOA before the next parliament session. “We also demand to provide appropriate and adequate government support to 6 OBC communities within their own reservation provisions instead of granting them ST,” said ABSU president Pramod Boro. The move taken by the CCTOA assumes significance as the Group of Ministers, chaired by Assam health, PWD and finance minister Himanta Biswa Sarma, held its first round of meeting in Dispur to chalk out modalities how to go ahead with the Central government’s move without disturbing the interests of the existing ST communities in the state. 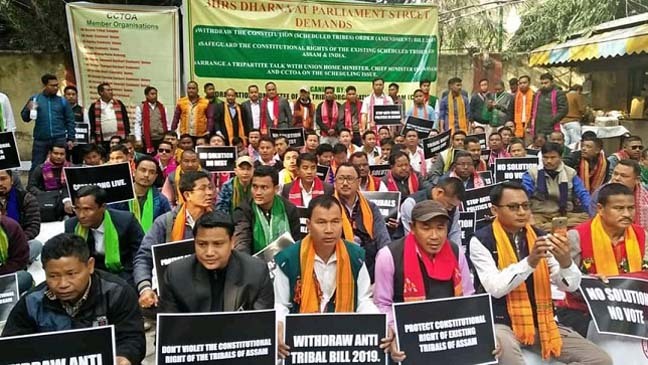 The CCTOA demanded that the ‘Constitution (Scheduled Tribes) Order (Amendment) Bill, 2019’ be immediately withdrawn from the House of Rajya Sabha in order to safeguard the constitutional rights of the Scheduled Tribes of Assam in particular and India in general. 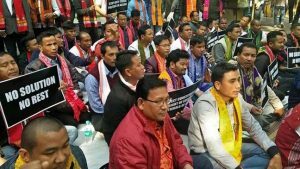 The coordination committee also urged the PM and Home Minister to immediately withdraw the recommendations made by Assam government and BTC administration for granting ST status to 6 communities.